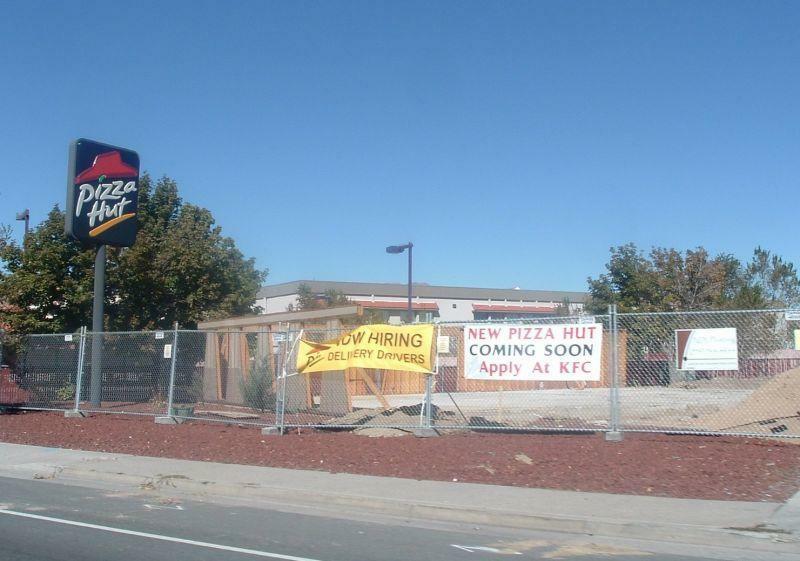 After nine months of waiting and construction, Carson City once again can enjoy the fine faux-Italian cuisine of our local Pizza Hut. 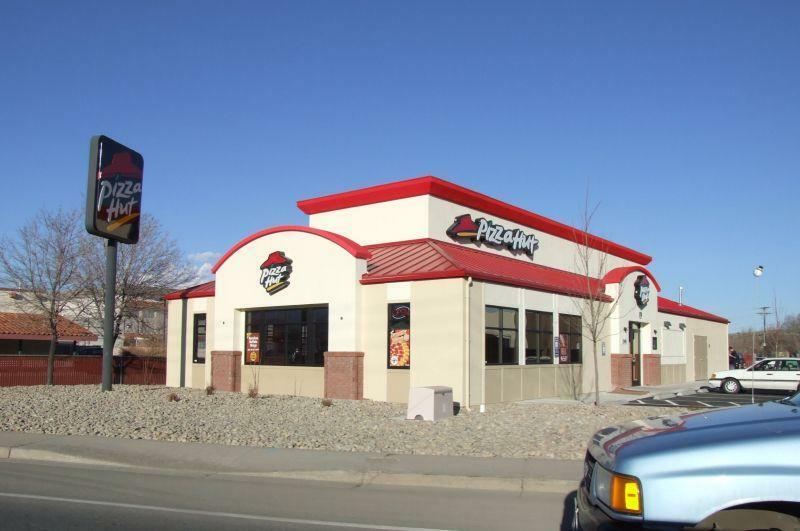 There had been a Pizza Hut in town on North Carson Street forever, but last year they decided that the building they were in wasn’t meeting their needs anymore. Their plan at the time was to tear down and rebuild from the ground up, but to still cook and sell pizza out of a trailer in the parking lot. 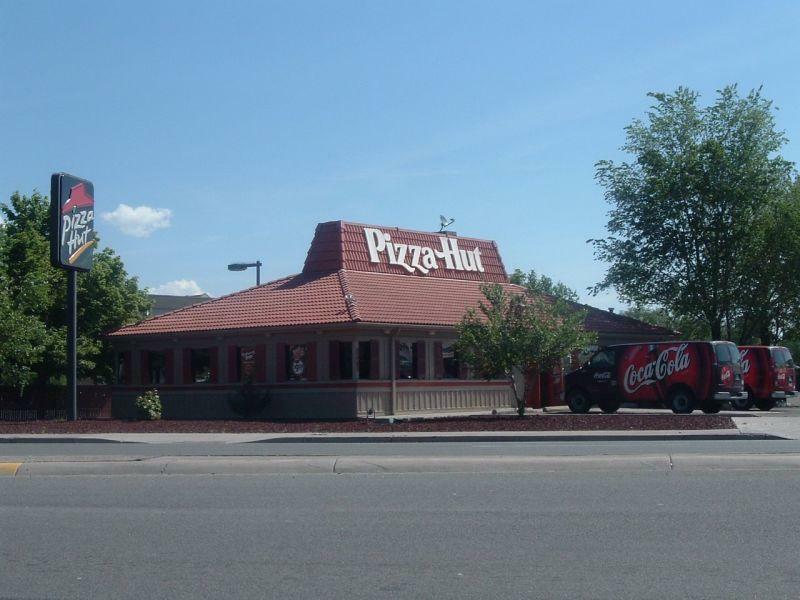 Pizza Hut in May 2005, right before it was demolished. So they brought in the official Pizza Hut Special Events Trailer, a 53-foot, self-contained beast with three ovens, walk-in fridge, and a freezer, which normally travels to places like the Super Bowl and the Kentucky Derby. And they were promptly shut down by the city because they didn’t have the proper permits to operate the trailer. So that part of the plan fell out from under them, like, immediately. Gone, except for two walls. September 2005. The second part of their plan was to build a shiny new restaurant. It was to be completed in six weeks, with a grand opening in July. Well, July came and went. As did August. And September. And for this whole time the lot sat vacant except for two sad little walls from the old building that they inexplicably didn’t knock down. It wasn’t until the cold fingers of winter gripped the capital that construction finally got underway on the new building. And once construction did start, it was no six-week job. It seemed to stretch on for months. What is it with Carson City and delayed construction projects, anyway? It’s like this town is cursed, and all construction gets delayed to five or six times past its original deadline. Maybe we’re sitting on a Mystery Spot. Finally open for business, February 2006. 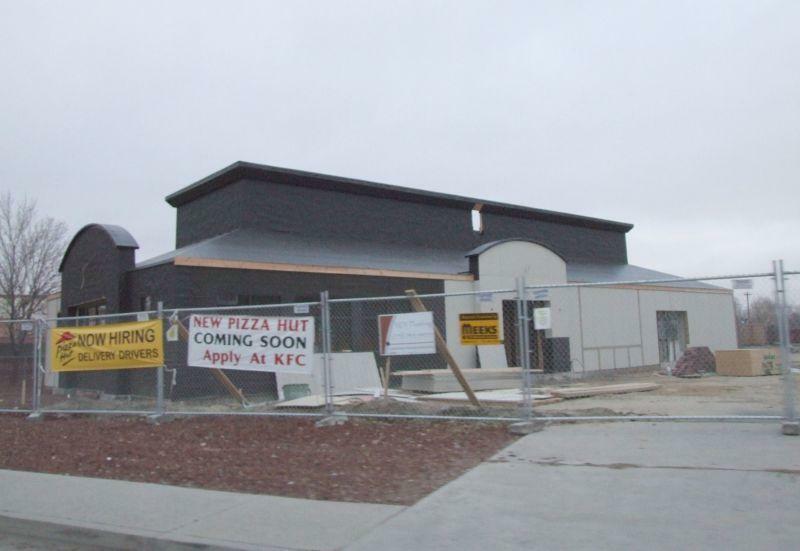 Anyway, it wasn’t until just this last week, in February 2006, a full nine months after the plan was first announced, that I saw the new Pizza Hut open for business. A lot longer than they anticipated, but at least they finally got the job done. So already they’ve got that advantage over the Ormsby House. So now we don’t have to travel to Reno to get our new Cheesy Bites Pizza, available for a limited time only, anymore. We can drop right in here in Carson. I just hope that with their new building comes some new management and staff, because we always dreaded going to the old Pizza Hut. Rude workers, menu items not available, and interminably long wait times for our food were always staples of our visits to Pizza Hut. If they’ve fixed those problems, then all this work has been worth it. If they haven’t, then screw ’em. I go to Papa Murphy’s anyway. I am the design/builder of this Pizza Hut. You are right!! Carson City building department is very hard to deal with, and they take pride in that. The other problem is with the local work force. I should only need to say UNION!! Your community is the worst in this area. Many developers and builder like myself have been caught off guard by this shake down in Carson City. It is safe to say we will never build or invest in Carson City. For the record, it was never a 6 week schedule. We have built them in 6 weeks, but that was in a cummunity that has a work force that is honest and hard working and a building department filled with men that are helpful. To date I have built over 4000 projects over the past 25 years all over the world.